Firstly, authenticating your domain is different to verifying it. When you set up your Mailchimp account, you were most likely prompted to verify your domain to confirm that you own it (through an email confirmation). This is enough to send email campaigns, however there’s a few extra steps involved to authenticate your domain, which ensures your campaigns look professional and more importantly keeps your spam rate at bay. In a nutshell, authenticating a domain helps ensure your campaigns actually make it to your subscribers’ inboxes. Google, Yahoo, Microsoft and the likes use DKIM and SPF authentication as a way to scan incoming emails. Emails that fail authentication are more likely to go to the spam or junk folder. Don’t get freaked out by all the fancy tech words – we promise it’s much easier than it seems and we’re confident that you can do it. NB: The following steps are best executed on a desktop. Go to Mailchimp and log into your account. Click on the little arrow next to your account name on the top right-hand side. 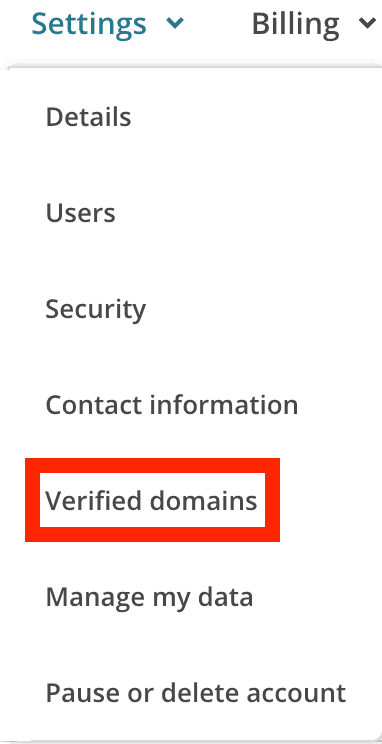 If you haven’t verified your domain yet, click on the ‘Verify a domain’ button on the right-hand side and follow the steps (you’ll receive an email with instructions). Once that’s done, click on ‘View setup instructions’. From here, we need to adjust the DNS records of your domain. To do this, open a new tab in your browser, go to the website of the provider you bought your domain from, e.g. GoDaddy, CrazyDomains, NetRegistry, etc. and log in. We’re going to show you the next steps using GoDaddy screenshots, however the basic steps are the same for most providers. If anything is unclear, it is best to get in touch with your provider support team directly. Once you’ve logged on, click on ‘My products’ and you will see your registered domains listed under ‘Domains’. 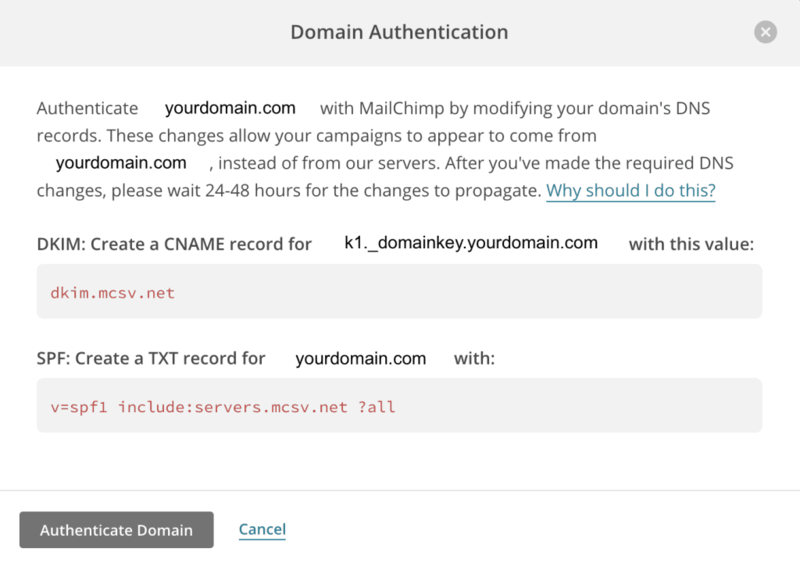 Click on the ‘DNS’ button to the right of the domain you’d like to authenticate with Mailchimp. Don’t get overwhelmed by all the letters and numbers you see, otherwise referred to as DNS records. They’re very important but can be ignored in this instance, just don’t edit/delete any of them! What we need to do is add a new DNS record: Simply scroll down and click on the green ‘ADD’ button. We need to copy and paste the information from this pop-up into the fields in front of you. Select ‘CNAME’ from the dropdown menu to populate the ‘Type’ field. 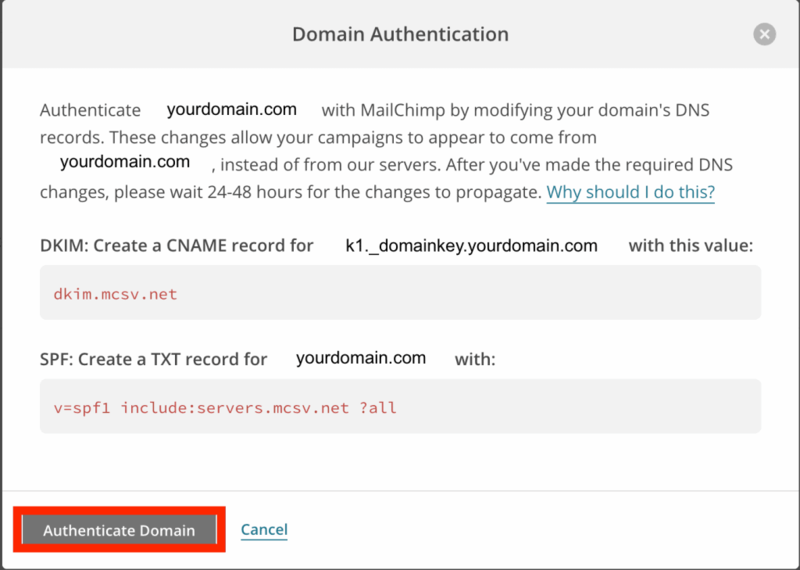 Copy k1._domainkey.yourdomain.com from Mailchimp and paste it into the ‘Host’ field. 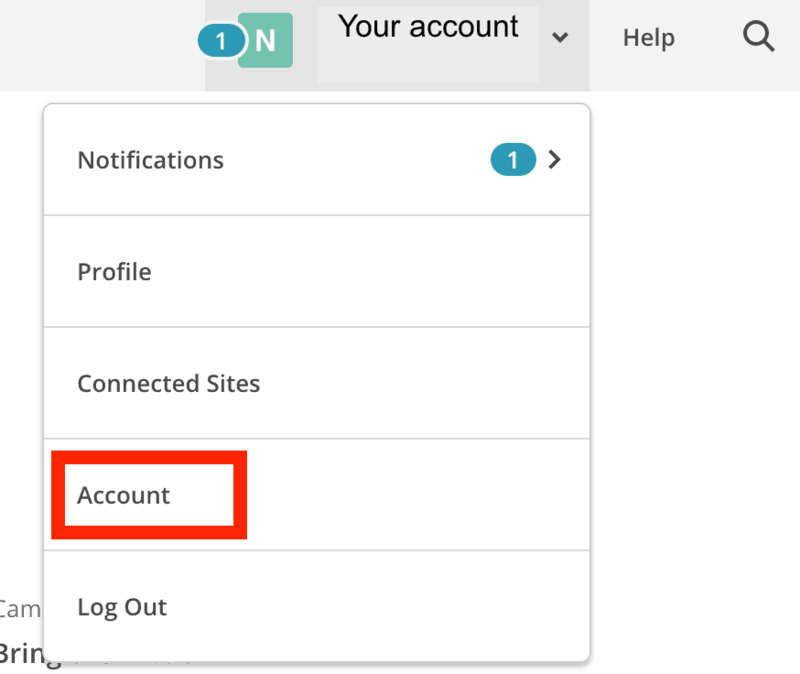 Copy the value from Mailchimp and paste it into the ‘Points to’ field. Then hit the green ‘Save’ button. The page will now refresh and you’ll see your new CNAME record added to your existing DNS records. For the TXT record, click on ‘Add’ again. Select ‘TXT from the dropdown menu to populate the ‘type’ field. Copy yourdomain.com from Mailchimp and paste it into the ‘host’ field. The page will now refresh and you’ll see your new TXT record added to your existing DNS records. Done! You can log out of your provider account. Sometimes it can take 24-48 hours for your new DNS records to get picked up by Mailchimp. To pass the time, do a happy dance and pour yourself a glass of wine! You can try this step after a few minutes or the next day, but don’t skip it. Go to your Mailchimp tab and click on the ‘Authenticate Domain’ button. Once your records have come through, a confirmation will be displayed. Pat yourself on the back, you did good! If you’re not seeing a confirmation after 48 hours, no need to stress. Simply get in touch with your domain provider support team. Alternatively, you can get in touch with us and we can look into it or set it up for you for a small one-off fee.